Audi Q7 Review: There is more than one way to reduce a vehicle’s environmental impact. One way is to make it smaller. Another is to improve its efficiency. Audi’s seven-passenger, 5,500-pound Q7 crossover has chosen the latter. For the last three years, the Q7 has been competing vigorously with Mercedes-Benz and BMW, as well as the high-priced Japanese brands, for a piece of the slightly downsized luxury crossover market. What Diesel does is move those combined miles per gallon numbers up from 15 or 16 miles per gallon to 20, with highway mileage at a surprising 25 mpg. It’s 20 percent cleaner and 30 percent more fuel efficient than a gasoline engine. I averaged 19.7 mpg during my test week, and clocked 28.5 mpg during a 35-minute freeway trip. Long family trips would likely elicit something closer to the latter number. Diesel has taken a rap for its smell and particulate matter (soot), but that’s changed now with the advent (finally) of ultra low sulfur clean Diesel in the U.S. Today’s Diesel-burners are legal in all 50 states. The Q7 TDI is easy to live with, just pull up a little further to the Diesel hose at the pump. The scent is nearly gone. 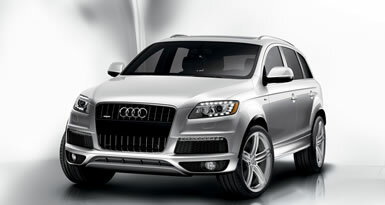 With its higher mileage and a generous 26.4-gallon (100-liter) tank, you can expect about a 600-mile range in the Q7. You’ll need to stop for human bio breaks and meals long before you run out of fuel. The 3.0-liter Diesel engine puts out what sounds like a modest 225 horsepower, but also a massive 406 lb.-ft. of torque at a quite low 1750 rpm. You can tow 6,600 pounds with that amount of grunt. And, there’s virtually no Diesel clatter, thanks to generous insulation. I only noticed it when I opened the window at a drive-through window (I confess). There’s a reasonable chance that your passengers could be blissfully unaware of the TDI under the hood. Other engine options include a 280-horsepower 3.6-liter V6 and a 350-horsepower 4.2-liter V8. These gasoline engines are mainstays of Audi and are available in the sedans as well. The Q7 borrows its looks, inside and out, from its elegant sedans, especially the A6 and A8. That means you get a massive mouth grille up front, sporty sill lines along the sides, a coupe like window greenhouse, and a tapered, carlike tail with Audi-style taillamps. The 200-inch long, 5-foot-8-inch tall cruiser makes a big impact on the road, but is not at all the boxy SUV look of the past. Riding on dual wishbones at all four corners, there’s not a hint of a truck feel. Despite it not being an SUV (exactly) there’s still plenty of utility here. With all seats folded, the Q7 offers 72.5 cubic feet of flat cargo area. There are 28 different rear seat configurations. The second row seats slide forward and back more than 8 inches, allowing more people or cargo space as needed. I took my bike down to fill its tires and it swallowed it up easily. Passengers will appreciate the extremely comfortable seats and the pleasure of an Audi interior, renowned in the business for top level materials, fit and finish, not to mention sophisticated style. With the optional S Line package ($1,200), my car got brushed aluminum decorative inlays and a special multifunctional steering wheel with shift paddles. Outside, the package upgrades the alloy wheels to handsome 20-inchers. My Calla White test car featured the optional Panorama sunroof. At 5 and a half feet long, its three glass panels cover a good portion of the roof, and provide light and ventilation to everyone. A translucent shade protects occupants from roasting in there during midday. To help promote the improved environmental performance of the Q7, on June 24 Audi launched the Facebook Cause campaign to benefit The Nature Conservancy’s Tensas River Basin project to reduce carbon emissions. Audi will donate $1 for every Facebook user who joins at www.causes.com/natureconservancy . The money will go to voluntary carbon offset programs. As a premium vehicle, the Q7 is loaded with stuff to make you happy, comfortable, and safe. That includes leather seating, dual-zone automatic climate control, and a power tailgate, just at the tip of the iceberg. Crash zones, padding and a varied assortment of airbags protect you in case of a collision. The Q7 gets top 5-star ratings for frontal and side crashes. Of course, Audi’s Quattro four-wheel-drive system helps keep the car on the road. Prices start at $44,325 for the V6 model. My TDI tester listed at $50,900, but with options and destination charges came to $62,375. If you need to carry your family in style, comfort, and occasionally, on less than perfect roads, the Q7 TDI offers an attractive and reasonably efficient way to do it.